Flag Football trophies, medals and plaques are used to celebrate and commemorate a fun season. This category has a great selection of flag football awards. Whether you need an economy trophy or a more elaborate flag football award, you are sure to find the perfect flag football trophy here. FREE Shipping on orders over $100. FREE Engraving. The Laurel Flag Football Trophy is available with several different inserts. This beautiful flag football award is a great value. All custom built flag football trophies come with a laser engraved brushed gold plate. You will find a wide selection of flag football awards here. FREE Shipping is available on orders over $100. FREE Engraving. This is a great choice for an economy football trophy. Choose a cheap football trophy for your team or tournament trophy event. The Mega Star Flag Football Award is a great choice for your star players. This Flag Football Trophy is economically priced to fit any budget. All custom built flag football trophies come with a laser engraved brushed gold plate. You will find a wide selection of flag football awards here. FREE Shipping is available on orders over $100. FREE Engraving. This is a great choice for an economy football trophy. Choose a cheap football trophy for your team or tournament trophy event. 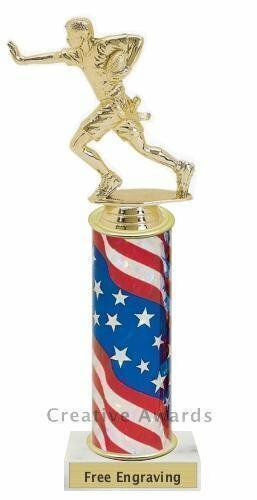 The USA Flag Football Trophy is an inexpensive flag football award that children have enjoyed for many years. These flag football trophies are a great choice for any budget. Flag Football awards come with a laser engraved brushed gold plate. FREE Shipping is available on orders over $100. FREE Engraving. This is a great choice for an economy football trophy. Choose a cheap football trophy for your team or tournament trophy event. The Winged Flag Football Award has a round Column with flaming golden wings. This flag football trophy is a more elaborate choice that is still economically priced. All custom built flag football trophies come with a laser engraved brushed gold plate. You will find a wide selection of flag football awards here. FREE Shipping is available on orders over $100. FREE Engraving. This is a great choice for an economy football trophy. Choose a cheap football trophy for your team or tournament trophy event. Need an economy flag football championship trophy? Whether you call it a large trophy, tall trophy, big trophy, 2 column trophy or 2 post trophy, you are sure to find a wide selection of championship trophies here. These large trophies make great flag football awards. The big trophies, also known as 2 post trophies or 2 column trophies, have a lot of character. For tall trophies, these flag football trophies are economically priced. The flag football award is available in several sizes. When you specify the height of the flag football trophy, the columns will be increased as needed. Free shipping is available on orders over $100. Free engraving is always included. This is a great choice for an economy football trophy. Choose a cheap football trophy for your team or tournament trophy event. Need an imperial flag football championship trophy? Whether you call it a large trophy, tall trophy, big trophy, 2 column trophy or 2 post trophy, you are sure to find a wide selection of championship trophies here. These large trophies make great flag football awards. The big trophies, also known as 2 post trophies or 2 column trophies, have a lot of character. For tall trophies, these flag football trophies are economically priced. The flag football award is available in several sizes. When you specify the height of the flag football trophy, the columns will be increased as needed. Free shipping is available on orders over $100. Free engraving is always included. This is a great choice for an economy football trophy. Choose a cheap football trophy for your team or tournament trophy event. Need an perpetual flag football championship trophy? Whether you call it a large trophy, tall trophy, big trophy, 2 column trophy or 2 post trophy, you are sure to find a wide selection of championship trophies here. These large trophies make great flag football awards. The big trophies, also known as 2 post trophies or 2 column trophies, have a lot of character. For tall trophies, these flag football trophies are economically priced. The flag football award is available in several sizes. When you specify the height of the flag football trophy, the columns will be increased as needed. Free shipping is available on orders over $100. Free engraving is always included. This is a great choice for an economy football trophy. Choose a cheap football trophy for your team or tournament trophy event. Need an royal flag football championship trophy? Whether you call it a large trophy, tall trophy, big trophy, 2 column trophy or 2 post trophy, you are sure to find a wide selection of championship trophies here. These large trophies make great flag football awards. The big trophies, also known as 2 post trophies or 2 column trophies, have a lot of character. For tall trophies, these flag football trophies are economically priced. The flag football award is available in several sizes. When you specify the height of the flag football trophy, the columns will be increased as needed. Free shipping is available on orders over $100. Free engraving is always included. This is a great choice for an economy football trophy. Choose a cheap football trophy for your team or tournament trophy event. Need an victor flag football championship trophy? Whether you call it a large trophy, tall trophy, big trophy, 2 column trophy or 2 post trophy, you are sure to find a wide selection of championship trophies here. These large trophies make great flag football awards. The big trophies, also known as 2 post trophies or 2 column trophies, have a lot of character. For tall trophies, these flag football trophies are economically priced. The flag football award is available in several sizes. When you specify the height of the flag football trophy, the columns will be increased as needed. Free shipping is available on orders over $100. Free engraving is always included. This is a great choice for an economy football trophy. Choose a cheap football trophy for your team or tournament trophy event. Need an victorious flag football championship trophy? Whether you call it a large trophy, tall trophy, big trophy, 2 column trophy or 2 post trophy, you are sure to find a wide selection of championship trophies here. These large trophies make great flag football awards. The big trophies, also known as 2 post trophies or 2 column trophies, have a lot of character. For tall trophies, these flag football trophies are economically priced. The flag football award is available in several sizes. When you specify the height of the flag football trophy, the columns will be increased as needed. Free shipping is available on orders over $100. Free engraving is always included. This is a great choice for an economy football trophy. Choose a cheap football trophy for your team or tournament trophy event.